A revolutionary solar thermal technology is to be tested in Mexico, thanks to funding secured by Queen Mary University of London (QMUL) and industry partner Larkfleet Ltd. The solar steam technology concentrates the power of the sun’s rays to heat water in order to create steam which can be used in industrial processes. The funding, provided by Innovate UK, the Newton Fund and the National Science and Technology Council in Mexico (CONACYT) will allow an already developed prototype of the solar collector to be improved, to the point of commercialisation, at a site in Mexico's Morelos state. With a total budget of £800,000, the project kicked off in February 2017 and is expected to take two years to complete. It relies on innovative solar steam technology, developed and patented by Bourne-based Larkfleet Ltd, which uses plastic Fresnel lenses instead of conventional glass reflectors used on solar collectors. The Fresnel lenses frame rotates to track the movement of the sun through the sky during the day using a fully automatic system. This allows for the concentration of maximum levels of solar radiation on the tubes. The new design is lighter, which makes it transportable and potentially easier to manufacture. A prototype of the design exists in Peterborough but the funding now allows the project to test an improved rig under higher solar radiation in Mexico. The Latin American country has some of the highest solar radiation in the world, but lacks sustainable methods of supplying low carbon heat to the industrial sector. The technology is ideal for medium temperature applications, such as manufacturing textiles, chemicals and medicines, cooking, or any application requiring temperatures up to 250C. QMUL acts as the project’s UK academic partner, leading the research on lenses and solar collectors. The team will work with external partners including the National University of Mexico (UNAM) and ITEnergy, who will facilitate the implementation of the system in Mexico. 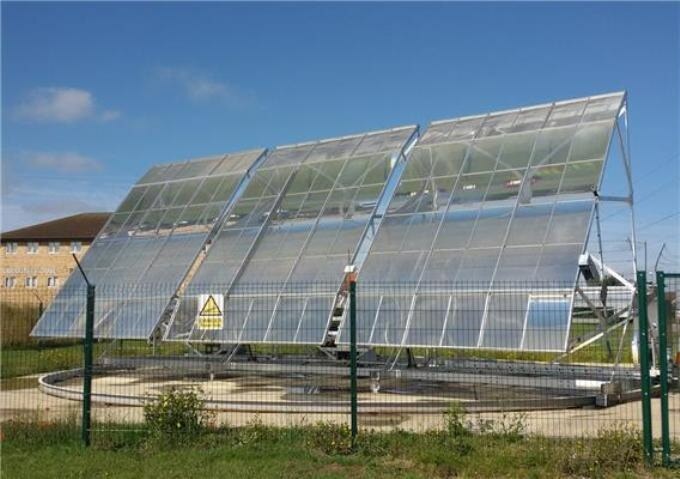 Simone Perini, project manager at Larkfleet Ltd, said: “The Solar Steam project builds on existing ideas about using solar radiation to generate heat and takes them a step further. Following extensive testing in the UK – where the weather is often not ideal for concentrating solar thermal power – we are taking this technology to a wider market where we believe it will have a positive impact on the generation of sustainable and renewable heat. This collaboration with academic, commercial and international funding partners to deliver a demonstration installation in Mexico is the next step in the commercial and technical development of the concept."